With the brand new floor cleaner TD BASIC 410, TD INDUSTRIAL 410 and a version with suction system we extend our range of surface cleaners. The INDUSTRIAL versions can be used with hot water up to 120 ° C at 2,000 revolutions per minute for operations up to 500 operating hours. The TD 410 with suction device is also equipped with an extremely robust swivel joint with carbide sealing elements. Whether in professional or industrial use, our floor cleaners prove themselves with very good cleaning properties. 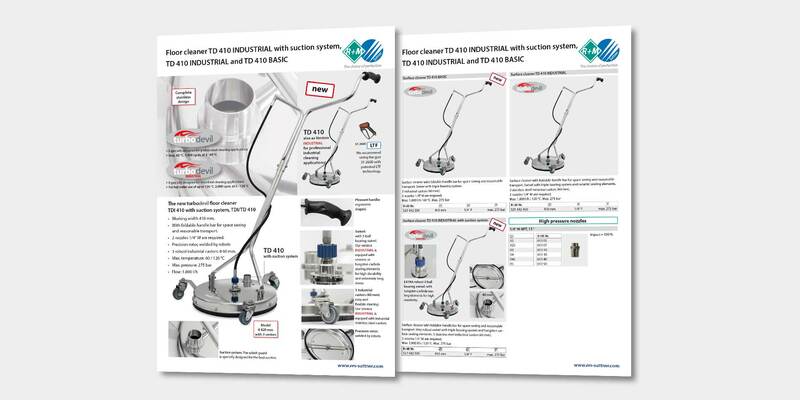 Detailed information on the new turbodevil 410 Floor Cleaners can be found on our data sheet.